The history of Wabash is long and full of interesting stories. It is through the stories of alumni that the history of Wabash is passed from generation to generation. For over 180 years the men of Wabash have left this campus and, as alums, have returned. Many things in our world have changed. Yet, as the excerpts below will show, the love that Wabash men have for their old college is timeless. I have been requested by Dr. Kane to give some reminiscences of the early days, and men, of “Old Wabash” as she was at the time of my student life in the early 40’s. 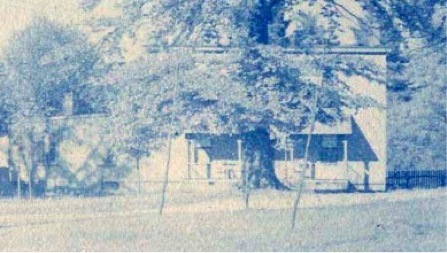 Purchased by Caleb Mills, Forest Hall was then taken apart and moved to the “new campus” where it stood on the site of the future Sparks Center. The first building was erected on a tract of land donated by Judge Williamson Dunn, afterwards, one of the chief benefactors of Hanover College. The ground was some distance northwest of the town, not far from Sugar Creek. No wagon road passed nearer than one or two hundred yards north of the building. The western limits of the town extended to what is now called Grant Ave. west of all that was native forest, except a small place a short distance West of this Avenue on Main Street, where Nathaniel Dunn had his residence and tan yard; there were also other small clearings being opened up. The students who lived or boarded in town followed a path which passed through the forest, crossing over two or three rail fences before reaching the College building. The money to erect it was no doubt raised in the east, as it would have been impossible to have raised it for such a purpose in the West. The building was frame, unpainted, three stories high including the basement. From the front facing South, where we entered, it was apparently only two stories, the ground sloping gently to the North, so the front entrance was on a level with the ground, while at the North it opened from basement, also on a level with the ground. The basement was wholly occupied as a residence for the Janitor’s family, who cared for the building and boarded the students, occupying the few rooms not used for Chapel and recitations. As I remember, there were three student rooms on the second and third stories. The chapel occupied the East half, less hall room, of the story above the basement. The Southwest corner was President Baldwin’s recitation room. The Chapel was used by Prof. Mills, and the Southeast and Southwest rooms upstairs by Profs. Hovey and Thomson. This arrangement continued until the removal to the new building on the present site. Often, in quiet hours, I live over the past. I am again a boy, just entering college, and for the first time meeting my classmates and teachers. I am again with classmates and student friends on the campus, engaged in the sports of youthful days, with them in debate and exercises in Society hall, with them in the Chapel at the morning hour of prayer, with them in recitation rooms receiving the instructions of our teachers, and finally, on graduation day speaking from the rostrum of the “Aspirations of Youth”, and bidding farewell to classmates and teachers. I am with classmates, receiving the hand of our president, our diplomas, each of us with youthful hopes—parting, each to act his part in the drama of life. The scene changes. Many years have passed. I am now an old man and age is reckoning. Nevermore in this world shall I see the faces or hear the voices of my classmates or teachers; they have all passed on, but with reverent faith and trust I hope to meet them, with all other friends, in that world where life is real and eternal. Whether I shall be permitted, again, to visit my Alma Mater, I know not, but whether present or absent, my warmest affection goes out to her, and the best that I can wish for her is that prosperity and growth may continue in the future as in the past. That her halls may be filled with students receiving that instruction that shall fully equip them mentally, morally and physically, for all the duties of life and good citizenship.